Things to Know Before Tackling the Trails | Intimidator Inc.
Over the hills and through the woods...to have a little fun and stir up some dust! Are you ready to tackle the trails? This is no doubt a popular pastime for those who love being outdoors and don’t mind getting a little dirty. However, if you are new to taking out your ATV or UTV on the trails of a nearby trail riding park, there are a few things you should know to make sure your day is a good one. Now, we are not saying you need to share your toys with strangers, but there are a few things you need to understand if you are a newbie to riding the trails. First and foremost, you must understand that unless you are on your private property, chances are high that you are sharing the trails with others. They may be riding dirt bikes, ATV’s, UTV’s, or even horses. They may also be walking or jogging. To make time on the trails run a little smoother, learn different communication strategies that most trail riders use as a courtesy such as using hand signals for large groups. For example, if you are in a large group and someone pulls over to the side to allow your group to pass, it is a courtesy to show the other rider how many are in your group by using hand signals. This shows the rider who pulled off to the side how many are in your group and when it is safe to get back on the trail. The last thing you would want is for the last person in your group, who is going a little too fast trying to catch up, to run into an unexpecting traveler. When it comes to riding the trails, it’s likely that you will not come across a speed limit sign. However, common sense tells you that you are on a trail. Trails have sharp curves, rocks, and roots that make the ground uneven. There is also a good chance, unless you are on personal property, that you are also sharing the trails with others. Going too fast can cause a lot of unfortunate accidents. Whether you know the trails or not, slow down as a courtesy to others and to keep yourself safe. Most trails have trees and bushes and shrubs. Being surrounded by nature is part of the excitement as you take yourself deeper and deeper into the woods. However, these natural elements can pose a problem if there are several sharp turns on the trail. Think of the trees and bushes as blind spots. They make it difficult to see if others are coming your way or if there is a sharp turn ahead. By being cautious and aware that there could be blind spots, you will have more control over your trail ride. Many of the trails open to ATVs and UTVs are also open to people walking, jogging, riding a bike or even riding a horse. For this reason, “horseplay” needs to be kept to a minimum. When sharing the trail with others, especially those riding horseback, it is a good idea to move over to the side and even turn off your motor if it is on the loud side. It’s also a good idea to just ride the trails. Stay away from daring stunts and games of “catch the leader” or “off-road tag”. These types of games are best in open fields where you have enough room and not sharing a few feet space with others. 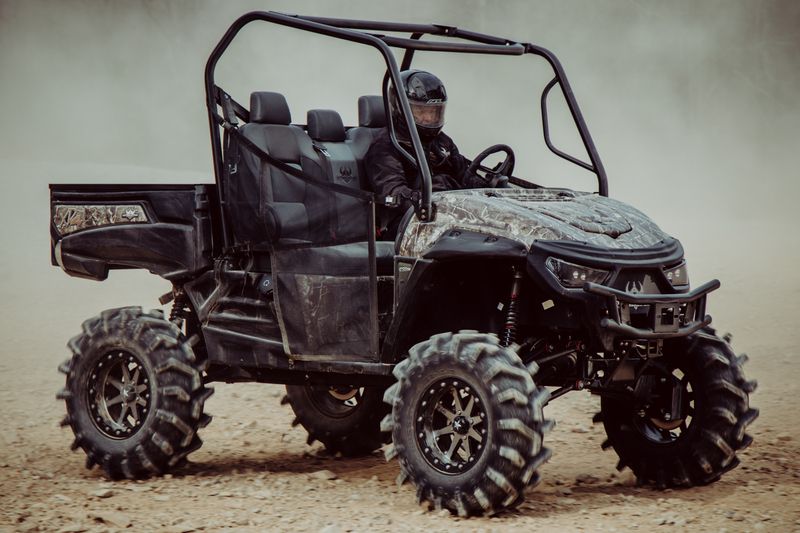 Intimidators, both UTV and ATV, are packed with safety features. However, the real safety comes with the person who is driving. Play hard and drive smart. To check out more details about our vehicles, visit intimidatorutv.com. Here, you can find the specs, including safety specs, for all of our vehicles. You can even use our Build Your Own Intimidator tool to create a vehicle that meets all of your needs...and wants. And to see our world-class side-by-sides up close and in person, visit one of our DEALERS. Click on the DEALER LOCATOR on our website to find one near you.